Soma Bay came to us at the end of 2014 directly from her breeder. Soma Bay – the inspiration for the name of this lovely mare comes from Soma Bay in Egypt. She impressed me immediately with her incredible rideability. Her external appearance is compact with a very good hind leg. Her paces are light footed, dynamic and she is very balanced. I just love her relaxed and willing character and her honest eye. She just has something about her that you cannot quite pinpoint. Her favourite past time is going out in the field with the ponies. Soma Bay has already won a mare only class, receiving a 9 for walk, trot, canter and rideability. The test rider even gave her a 9.5. 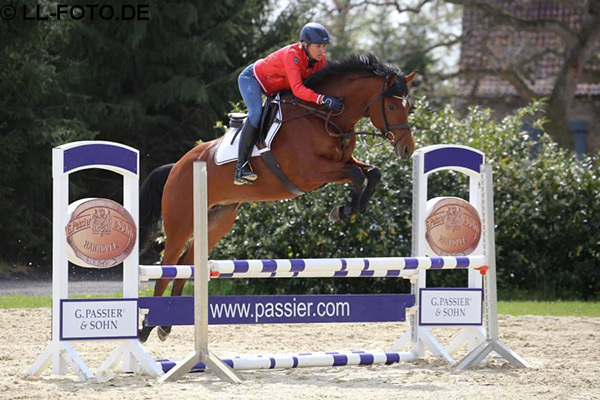 She was the second best mare in the whole of Westfalen of all the 3 year old mares to present under saddle in 2014. She has also won 2 riding horse classes. 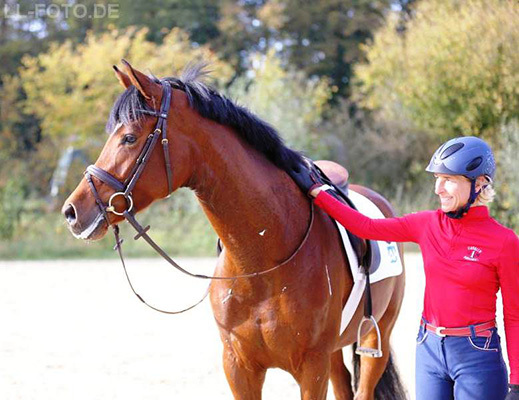 In 2015 Soma placed in multiple dressage and jumping classes at A level. At the end of the season she won a cross country class with a 9,0! In 2016 Soma Bay put some miles under her belt at dressage level L with Greta as well as with me in the saddle. Greta and Soma get along really well and Greta took Soma in her first Dressage Horse M level class finishing in second place. They were able to win the next competition! In 2017 Greta was 3rd at the Westfalen Championships and placed in the German Junior Championships. I have also won M level dressage tests with Soma. She learns very fast and it is great fun riding and training her. Soma will not be presented at competitions 2018, as she unfortunately has to take a break for health reasons. She is pregnant with Da Vinci Code and we are looking forward to her foal.